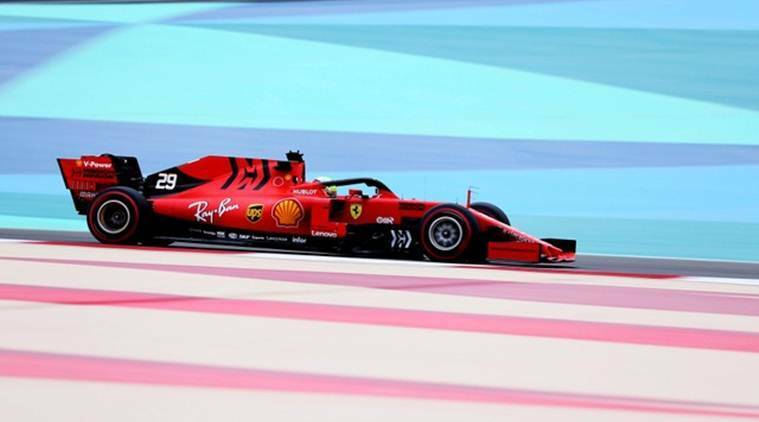 On a surprisingly wet day at the same track where his father won the first Grand Prix in the Middle East with Ferrari 15 years ago, Schumacher was 0.597 seconds slower than the 21-year-old Dutchman. His time of one minute 29.976 seconds was set on the softest, and fastest, C5 tyres — softer than anyone else’s — and he completed 56 laps on a day where track time was limited by bad weather washing out much of the middle of the day. The reigning European F3 champion will also test with the Ferrari-powered Alfa Romeo team (formerly Sauber) on Wednesday. Tuesday’s test was Mick’s first experience of a modern F1 car, although he did drive his father’s 1994 title-winning Benetton at the Spa-Francorchamps circuit before the 2017 Belgian Grand Prix. Michael Schumacher, who still holds the record of 91 Grand Prix wins, won five of his titles with Ferrari in a golden period from 2000 to 2004. He last raced for the team in 2006 before a comeback with Mercedes from 2010-12 and has not been seen in public since he suffered severe head injuries in a skiing accident in the French Alps in December 2013. Mick, who joined the Ferrari academy in January, was the only debutant on track in a rain-hit session that followed Sunday’s second Grand Prix of the season. Lewis Hamilton, Sunday’s race winner for Mercedes after Ferrari’s Charles Leclerc suffered a late engine problem, was sixth fastest. Double world champion Fernando Alonso, who left Formula One at the end of last season, was back in McLaren testing tyres for Pirelli.